Grant Wood: American Gothic and Other Fables at the Whitney #ArtTuesday « Adafruit Industries – Makers, hackers, artists, designers and engineers! 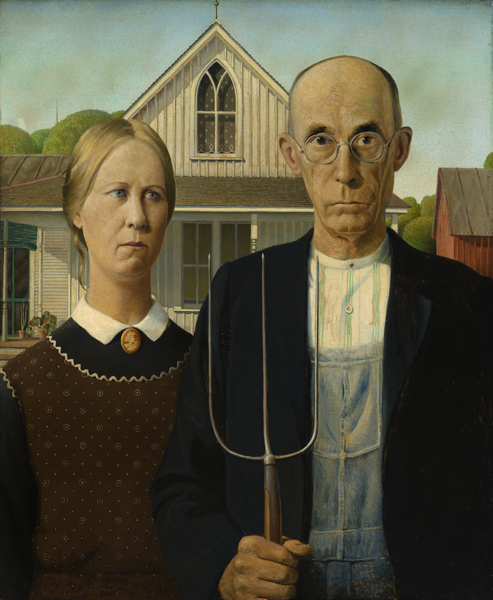 Grant Wood’s American Gothic—the double portrait of a pitchfork-wielding farmer and a woman commonly presumed to be his wife—is perhaps the most recognizable painting in 20th century American art, an indelible icon of Americana, and certainly Wood’s most famous artwork. But Wood’s career consists of far more than one single painting. Grant Wood: American Gothic and Other Fables brings together the full range of his art, from his early Arts and Crafts decorative objects and Impressionist oils through his mature paintings, murals, and book illustrations. The exhibition reveals a complex, sophisticated artist whose image as a farmer-painter was as mythical as the fables he depicted in his art. Wood sought pictorially to fashion a world of harmony and prosperity that would answer America’s need for reassurance at a time of economic and social upheaval occasioned by the Depression. Yet underneath its bucolic exterior, his art reflects the anxiety of being an artist and a deeply repressed homosexual in the Midwest in the 1930s. By depicting his subconscious anxieties through populist images of rural America, Wood crafted images that speak both to American identity and to the estrangement and isolation of modern life.